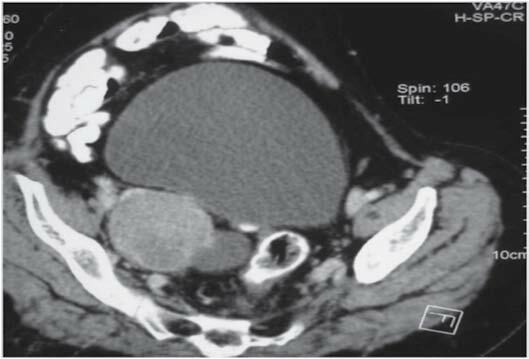 Gupta A, Noba AL, Gupta S, Arora VK, Rathi V, Kumar S. Papillary Cystadenocarcinoma of Ovary Presenting as Obstructive Jaundice: A Rare Presentation. Oman Med J 2012 Mar; 27(2):159-160. Keywords: Obstructive jaundice; Papillary cystadenocarcinoma; Ovarian carcinoma; Portal lymphadenopathy. A 50 year old female, presented at surgical clinic with complaints of pain in the upper right abdomen for 3 months and yellowish discoloration of eyes for 2 months. She had complaints of loss of appetite and weight loss. She had undergone hysterectomy one year back for fibroid of the uterus and open cholecystectomy three years back for symptomatic cholelithiasis. On clinical examination, vitals were stable; icterus was present with scratch marks on the skin and no peripheral lymphadenopathy. Abdominal examination revealed right subcostal and midline infraumbilical scar mark of previous surgeries. Liver was palpable 2 cm below the right subcostal margin. USG abdomen showed enlarged liver with gross intrahepatic biliary dilatation and extrahepatic dilatation of the left and right hepatic duct with a hypoechoic ill defined lesion in the region of the porta hepatis. Distal CBD was not visualized. 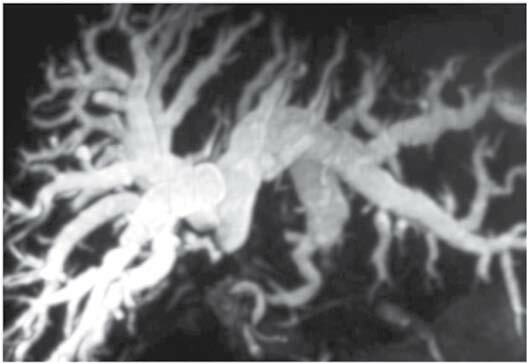 MRCP showed abrupt cut off of at the level of confluence of the right and left hepatic duct with gross intrahepatic biliary dilatation, (Fig. 1). CECT of abdomen was suggestive of multiple nodes at porta hepatis, gross intrahepatic biliary dilatation, hepatosplenomegaly and a solid cystic lesion in the right adnexa measuring 5.2 × 5.6 cm, (Fig. 2). The tumor marker CA125 was 123.7 U/ml with normal values of CA19.9, CA72.4 and CEA. Liver function test showed raised bilirubin (17 mg/dl) and alkaline phosphatase (300 IU/l). USG guided FNAC of solid-cystic mass from the right ovary showed cellular smears composed of papillary fragments of tumor cells. The tumor cells in the papillae showed nuclear grooves and inconspicuous nucleoli. Some cells showed marked nuclear pleomorphism and hyperchromasia. 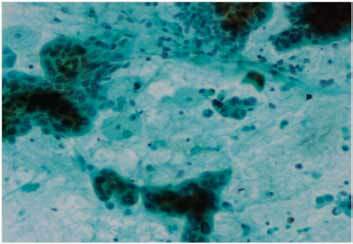 The background had numerous foamy macrophages and malignant cells present singly and in small clusters, (Fig. 3). These cytological features were diagnostic of papillary cystadenocarcinoma of the ovary. USG guided FNAC from the lymph nodal mass at porta showed metastatic papillary adenocarcinoma. The patient was subjected to neoadjuvant chemotherapy in modified doses in view of deranged LFT. After three cycles of chemotherapy, the bilirubin levels decreased to <3 mg/dl and subsequent CT scan revealed no nodes at porta and normal intrahepatic biliary radicals. She then underwent cytoreductive surgery. Figure 1: MRCP showing abrupt cut off of CBD with gross intrahepatic biliary dilatation. Figure 2: CECT Abdomen showing solid cystic lesion in right adnexa measuring 5.2 × 5.6 cm. Figure 3: Papillary Cystadenocarcinoma of ovary. Tumor cells are arranged in papillary architecture, singly or in small clusters (inset: papanicolaou stain ×100). The background shows foamy macrophages. some cells ahow marked nuclear atypia. Papanicolaou stain ×200. The bile duct can be invaded either via its wall or from contiguous masses or lymph nodes with displacement. Both can result in obstruction and ensuing jaundice. The latter is most frequent from cancers of the neighboring organs. Jaundice is the presenting sign in 70%.2 The tumors associated with malignant biliary tract obstruction are pancreas (80%), stomach (10-40%), colon (20-30%), melanoma (15%), breast 910%), duodenum (1%) and others (1%), as reported by Lokich et al.3 In ovarian carcinoma, the primary mode of spread is transperitoneal metastases as malignant cells exfoliate in the peritoneal cavity.4 Intraperitoneal spread is favored by intestinal peristalsis, negative hydrostatic pressure below the diaphragm, and the passage of exfoliated tumor cells that follow the intra-abdominal fluid stream passing along the paracolic gutters toward the diaphragm.5 Tumor can adhere to any surface of the peritoneum and dense tumor caking can cause infiltration into all abdominal organs and a mass effect on the omentum, ureter, bowel, liver, pancreas, spleen, and adrenals, resulting in advanced disease stages at presentation with associated ascites. The risk of involvement of the pelvic nodes is 80%, para-aortic nodes 78%, inguinal nodes 40%, mediastinal nodes 50%, and supraclavicular nodes 48%.6 The insidious onset of obstructive jaundice as the initial manifestation in carcinoma is of rare occurrence. Thomas et al. reported 30 cases of obstructive jaundice out of which only 2 cases were reported to be primarily from the ovary.7 The cause of jaundice is the extrinsic compression of the common bile duct by lymph node masses. Two such cases have been reported in world literature and this is the third to be reported. This was an interesting case because the presenting symptom was obstructive jaundice and after detailed investigation was found to be primary carcinoma of the ovary. This case highlights the importance of detailed and complete evaluation of patients presenting with biliary obstruction; thus, one should have a high index of suspicion to rule out secondaries at porta hepatis from a primary at a distant organ rather than from adjacent organs. 1. Rosenblatt M, Zafaranloo S, Tancer ML. Carcinoma of the ovary presenting as obstructive jaundice. Gynecol Oncol 1989 Mar;32(3):385-389. 2. Debois J. Kluwer. The Anatomy and Clinics of Metastatic Cancer, 2002. 3. Lokich JJ, Kane RA, Harrison DA, McDermott WV. Biliary tract obstruction secondary to cancer: management guidelines and selected literature review. J Clin Oncol 1987 Jun;5(6):969-981. 4. DeVita. Vincent T. Lawrence, Theodore S. Principles & Practice of Oncology, 8th Edition, 2008. 5. Halperin EC. Perez, Carlos A. Perez and Brady's Principles and Practice of Radiation Oncology, 5th Edition,2008. 6. Bregman F. Carcinoma of the ovary - a clinicopathologic study of 86 autopsied cases with special reference to mode of spread. Acta Obstet Gynecol Scand 1996;45:211 . 7. Thomas JH, Pierce GE, Karlin C, Hermreck AS, MacArthur RI. Extrahepatic biliary obstruction secondary to metastatic cancer. Am J Surg 1981 Dec;142(6):770-773.